Payment Center provides a Pay Now button that you can add to your existing Salesforce pages in order to collect credit card payments. 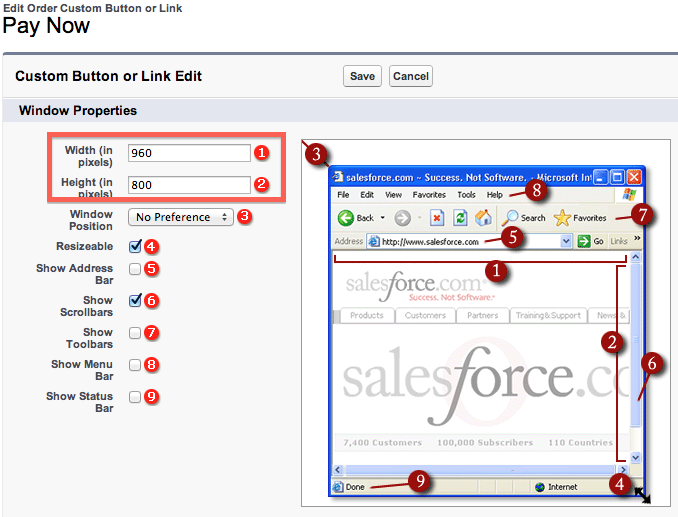 You can add the button in a standard Salesforce page, in an email template or in a Visualforce page. 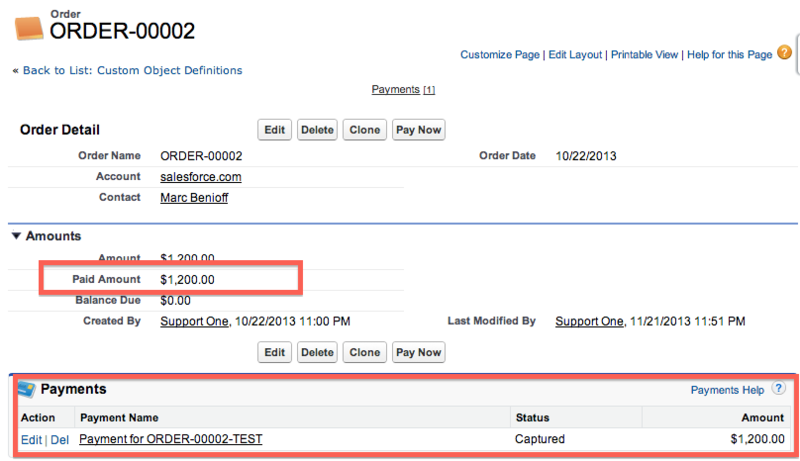 Create a relationship between our Payment object and your object (custom or standard). If your object is the standard Account, Contact or Opportunity objects, then there’s no need to create the relationships because they are already defined as part of the app. You may want to hide the New Payment button so as not to be confused with the Pay Now button we are about to add. amount – The amount to be charged. accountId – If your object has a lookup on Accounts, you can pass the account ID here. It is strongly recommended that you pass this value so that the billing address defined at the account level will pre-populate the address in the payment page. And if you have defined a payment profile for the account, the information from the profile will also pre-populate the payment page. contactId – If your object has a lookup on Contacts, you can pass the contact ID here. 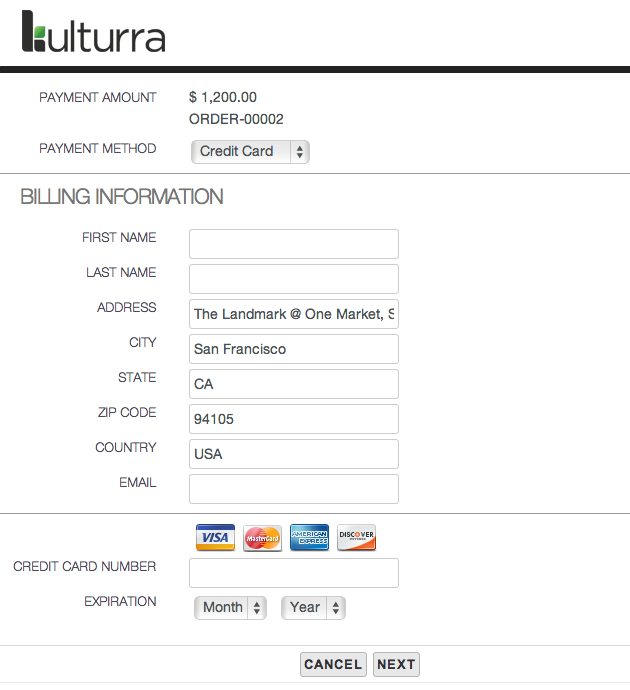 Just like the account, the appropriate fields in the contact will pre-populate the payment page. lookupField – The name (API name) of the lookup field defined in the Payment object, which is normally named the same as the lookup object itself. Note that value of this parameter is not a merge field, instead pass the actual name for the lookup field. lookupId – The ID of the current record in your object. reference – Any reference field you want saved in the Payment record. description1, description2, description3 – Additional parameters that can hold any information to be displayed in the payment page. currency – If you use different currencies, you can pass the desired currency here. If you don’t pass any currency, the default currency in settings will be used. billingStreet, billingCity, billingState, billingZip, billingCountry – If you have not passed the Account ID or Contact ID, you can explicitly pass the billing address using these parameters. firstName, lastName – If Contact ID is not passed, you can pass the first and last name as they appear on the credit card. email – You can optionally pass the payer’s email address. processor – If you are using different processors, you can explicitly pass the processor name here as defined in settings. If you don’t pass the processor, the default processor will be used. 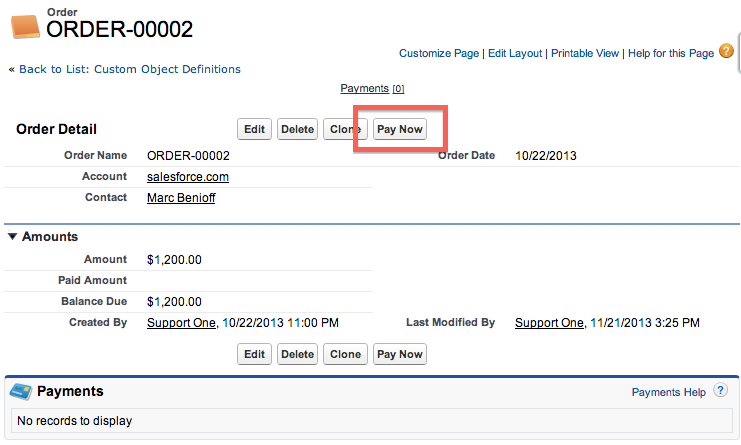 paymentType – You can pass “Charge” or “Authorization”. If this parameter is not specified, then the default payment type in settings will be used. redirectURL – The payment page is redirected to a confirmation page after processing the payment, if you want it to be redirected to a specific URL, then specify it here. doNotSendReceipt – true/false, indicates whether or not you want to send a receipt after payment. If you do not pass a value, the default settings will be used. 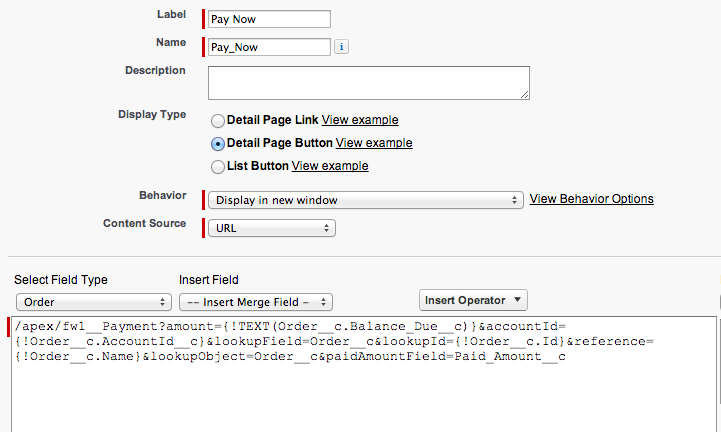 defaultPaymentMethod – When the payment page comes up, you can select a payment method from a dropdown. If you wanted the page to default to a specific payment method, you can pass the default here. More info on payment methods here. entity – You can pass an entity as defined here. Pass the ID of the entity. Details of the entity will be used where appropriate. For example, when sending the receipt, the sender and company name of the entity will be used. custom – Anything passed here will be saved in the payment record under Custom Information. For the processor PayPal Payments Pro, this information will also be passed onto the CUSTOM field in PayPal. profile – Possible value: new – if a payment profile exists it is normally defaulted in the payment page. But if you pass “new” to this parameter, the payment page will ask for new payment information. lookupObject – The name (API name) of your object. Note that value of this parameter is not a merge field, instead pass the actual name of the object. paidAmountField – The name of the field in your object that holds the paid amount. Since there could be more than one payment per record, the total will be accumulated in this field. Note that value of this parameter is not a merge field, instead pass the actual field name. If your page does not have any logo, you can quickly add a logo by following these steps: Adding your logo to your payment pages. Also verify that you support all the cards that is displayed on the page. To set your supported cards, please follow these steps: Setting supported credit cards. PaymentCenterLogo.png in the sample above is an image uploaded as a static resource. Prerequisite to calling the page outside of Salesforce is that the online payment setup should have been done. This feature is available in the November 2013 release.